Sweeney Todd has become a bloody, worldwide success since being awarded eight Tony's, (including Best Musical), for its Broadway premiere. Stephen Sondheim's and Hugh Wheeler's (A Little Night Music, Pacific Overtures) tasty, thrilling, theatrical treat has simultaneously shocked, awed and delighted audiences across the world. 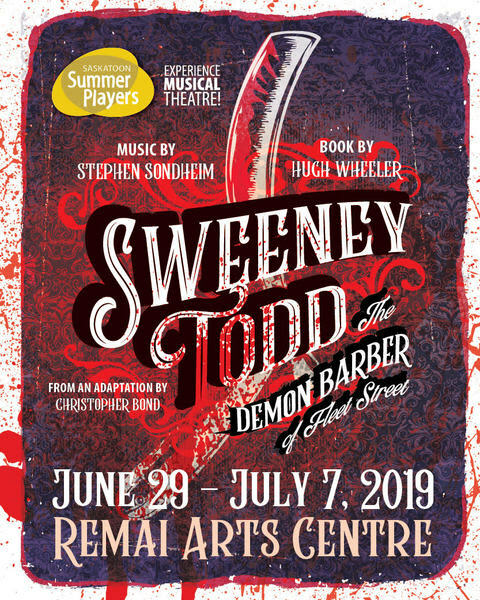 An infamous tale, Sweeney Todd, an unjustly exiled barber, returns to nineteenth century London, seeking vengeance against the lecherous judge who framed him and ravaged his young wife. The road to revenge leads Todd to Mrs. Lovett, a resourceful proprietress of a failing pie shop, above which, he opens a new barber practice. Mrs. Lovett's luck sharply shifts when Todd's thirst for blood inspires the integration of an ingredient into her meat pies that has the people of London lining up... and the carnage has only just begun! Please note that there are no performances on July 1st.